Why during Hollywood week do they allow some of the crappy singers through to the competition only to keep reminding them and us that they are crappy singers? Why do they do those cheesy group numbers? First of all American Idol is a singing competition and it is obvious that they lip sync those performances. Second even the contestants seem embarrassed to do them. Third stop messing up the Black Eyed Peas! Why do they make the people who get voted off sing again? Newsflash-if we wanted to hear them again we would have voted for them to stay! When someone gets voted off of Project Runway you don't hear Heidi Klum saying, "One last time, please go design us a really crappy dress". I am really enjoying Ellen being on the panel. In my opinion her funny comments really break up the monotony in the critiques. Are you guys watching this season? Any predictions so far? Not watching this year - and never have watched. Prefer watching someone like Dorkys sing and dance. Man, I wish I had cable if only to see Ellen in this. Is she really good? I was kind of iffy as to whether or not she'd fit in there. Lol, I agree with your questions. Crappy singers make for good TV and really, a part of me LOVED watching them struggle and think they had a chance at winning the thing. And you know what? Sometimes they get surprisingly far...thanks to Vote for the Worst or whatever it's called. Oh! And I gave you a little award on the blog so check it out when you get a chance! Dorkys-We vote for you as the next American Idol! That is funny that Fox is cable for you all because here it is one of the basic networks that you get without cable. I am really liking Ellen. I wasn't too sure at first either, but she has added a little more personality to the panel. I really like Kara as well. I thought I would miss drunk Paula because she always gave me a laugh, but I hardly notice she is gone now. There are a few that I really think are getting votes from Vote for the Worst this year because otherwise they should be long gone! I haven't really watched American Idol since the David-David year. I stopped because it seemed like they were starting to pick people with looks and personality over people who can actually sing. 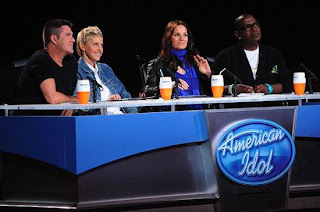 What I don't understand about American Idol is why you would pick a JUDGE that doesn't know anything about music to just be there to make funny comments. In that case, they should have just made her host than. Anyway, thats my 2 cents. Tyler-I agree. It is sometimes more of a contest based on looks than on actual vocal talent. So many great singers have been passed by over the years. Look at Jennifer Hudson and she is cute too. She surely should have won, but I guess she is the one laughing now! :) Her and her Oscar. I really didn't understand the whole Ellen thing at first. One day on her show she was saying that she thought she would fit because she always watched the show and she would be the voice of the people who watch from home and would be the ones who would actually be buying the music. That is pretty much the role she has been playing. I think it is a good mix of the technical stuff with Kara, Simon and Randy and then Ellen has her opinions based on how she feels as a viewer. I actually don't follow this show but I enjoy reading about it. My choice of reality TV is Real Housewives. Barkley is such a cutie pie. Happy early b-day to your fur kid! Peppermint Sage Designs-I have not watched the Real Housewives. After hearing so much about it from everyone I really need to catch some of the episodes. It sounds really crazy! Thank you! I need to go get Barkley some presents soon or he will not have much of a birthday! LOL! Not that he would know anyway, but I would! Jessie-I felt so bad when the mullet guy got kicked off last week and started crying. So sad and you know they do that to see them break down! I am not really loving anyone too much this year either. Hopefully it will get better!